Kumpulan Fima just released their results today. Net profit was decent at RM14.8 million, which was a 50% increase year-on-year. Earnings growth were observed across all business segments. Nonetheless, earnings were down by 15% quarter-on-quarter, triggered by lower profit from manufacturing, plantations and associates. EPS for the quarter was at 5.63 sen, with cumulative 9-Month CY2010 (Calender year) EPS standing at 16.9 sen. EPS for 4Q CY2010 could hit 6 sen easily, making EPS for the total year at 22.9 sen. Thus, PE for CY2010 could be at 5.7x. 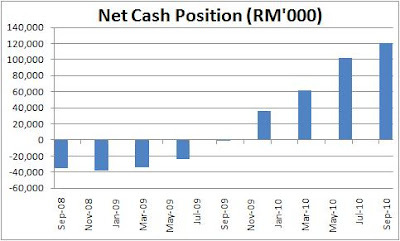 Net cash position continued to rise to RM120.7 million or 45.9 sen. I'm seeing another Faber in the making, quite similar in terms of the numbers. Recall that Faber was still at RM1.40 when net cash was at RM100m, PE of 6x, dividend yield at about 4% and stable and diversified earnings. Its stock price eventually doubled. I agree with you the fantastic financial performance of Kfima for the last quarter and the trailing twelve months results. Not only that. If you look at its balance sheet, cash increases from 128.6m to 168.3m whereas debt decreases from 66.4m to 47.6m. Ttm operations cash flows and FCF also increase from the already high cash flows by 15-20%. The question is so many lousy counters have flied high in this seemingly bull run, but not Kfima, why? Have been tracking Kfima too. Good fundamentals. 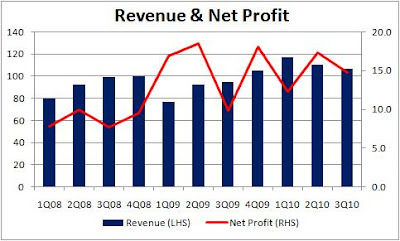 Similar also to TDM bf it went ballistic..
Where did you get the charts on revenue, profits and cash in hand...? Had it been classified under plantation, price will no longer be status quo...! Thanks mate for recent info. Be patient, KFima fundamentals strong. It is a metter of time the results will show up and then the price will go up accordingly.I myself is accumulation KFima. KFima onws 60% of FimaCorp and this approx RM1 pershare for KFima. Money coming in plam oil ath the same time.